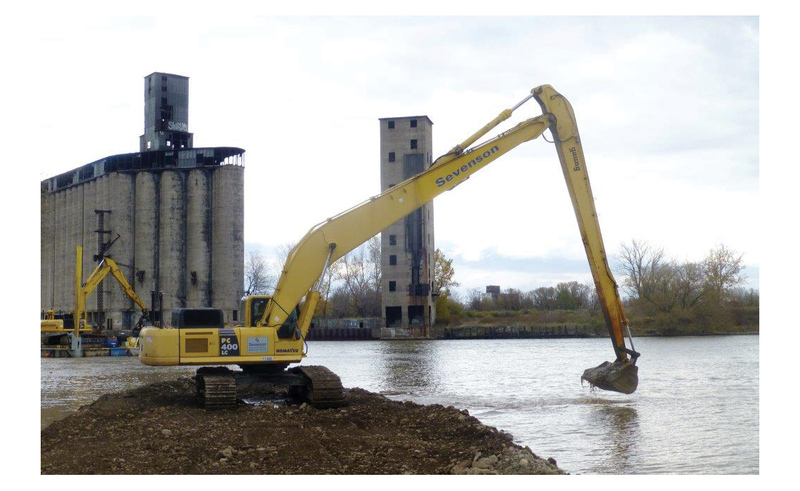 The Buffalo River Sediment Remediation Project is a Great Lakes Legacy Act (GLLA) project involving the cleanup of PCB-contaminated sediments along the lower Buffalo River and the City Ship Canal in Buffalo, New York. The Buffalo River Restoration Partnership, a unique public-private-non-profit partnership, jointly developed plans with the USEPA and a responsible party to address a number of environmental problems affecting these bodies of water. The environmental challenges included contaminated river sediments, poor water quality, a lack of safe public access, and insufficient fish and wildlife habitat. The partnership brought together diverse resources and expertise. The partnership developed plans for a comprehensive cleanup to transform the river into a beneficial environmental, economic, and community resource. Project was identified as an Area of Concern through the Great Lakes Restoration Initiative. 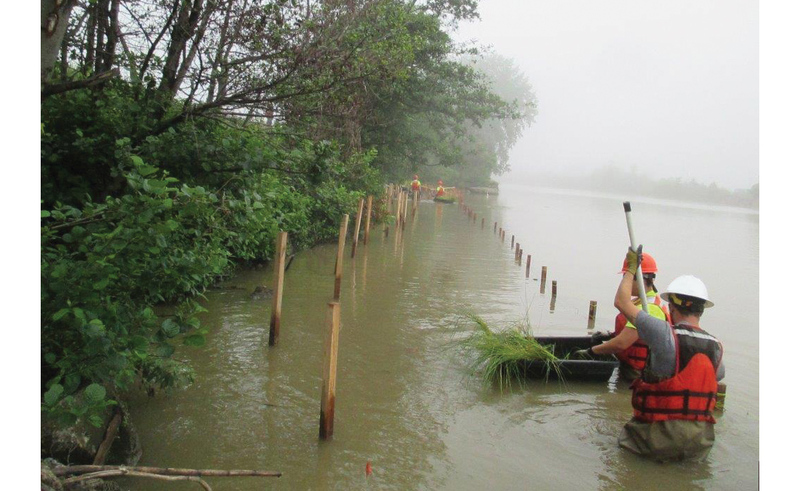 The cleanup and restoration of the river was conducted on a collaborative basis among USEPA’s Great Lakes National Program Office, Buffalo River Restoration Partnership and a responsible party. Mechanical dredging of approximately 412,000 CY of contaminated sediments with <50ppm PCBs from the lower 6.5 miles of the Buffalo River. Mechanical dredging of approximately 50,000 CY of contaminated sediments with <50ppm PCBs from the City Ship Canal. Mechanical dredging and stabilization of approximately 4,200 CY of >50ppm PCB sediments for disposal offsite at a TSCA licensed landfill. <50ppm PCB sediments were disposed of in the U.S. Army Corps of Engineers Cell #4 Confined Disposal Facility (CDF) in Lake Erie. 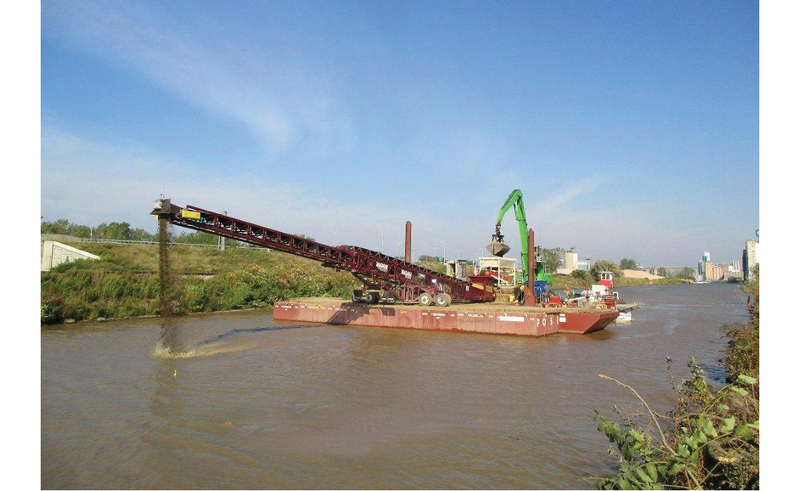 Dredging operations performed on a 24 hour, 7 days per week schedule. 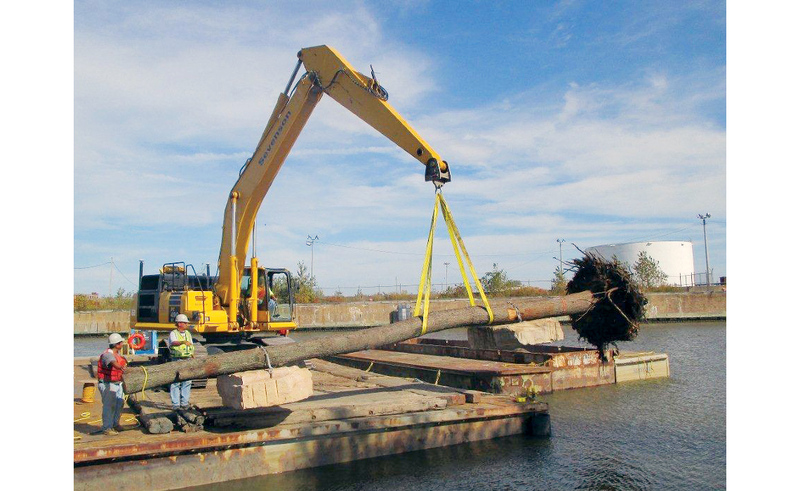 The USEPA’s Great Lakes National Program Office (GLNPO) issued a task order to Environmental Quality Management (EQM) under its SRAC contract to execute the harbor dredging work. 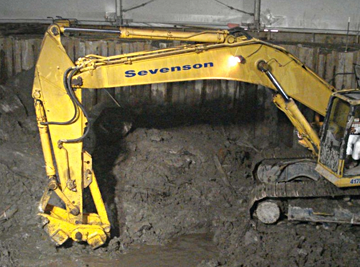 Sevenson, EQM’s team partner on the SRAC, was subcontracted to perform the dredging and stabilization tasks associated with the project. Upon receipt of the notice to proceed, Sevenson initiated site setup and preparation activities. This included project and support facilities. A preconstruction meeting with the United States Environmental Protection Agency (USEPA) and Buffalo, NY District U.S. Army Corps of Engineers (USACE) was held to coordinate efforts prior to commencement of dredging operations. A meeting with property owners, New York State Department of Environmental Conservation (NYSDEC), local government officials, and public interest groups was also held to discuss project coordination. 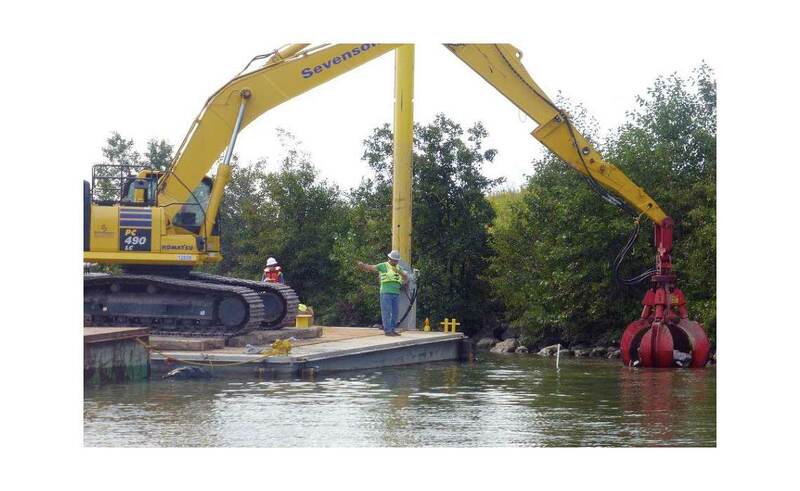 Environmental and marine controls were installed at the work areas prior to initializing dredging activities. Dredging commenced in October 2013, and was completed in late 2014. 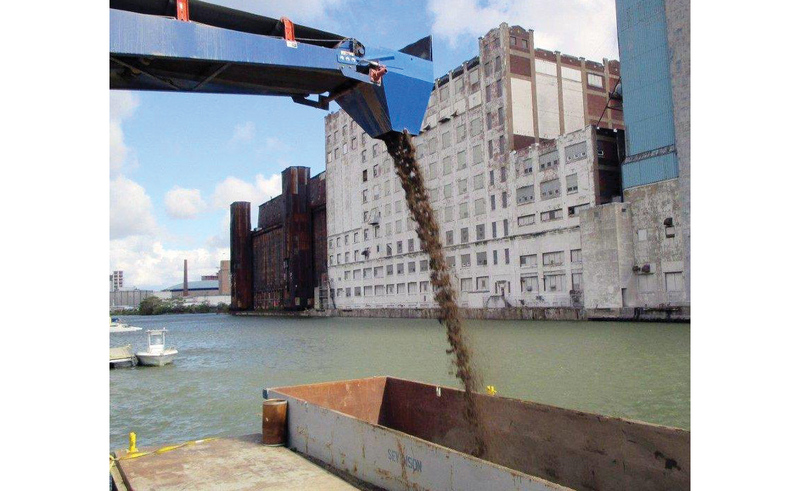 A total of 462,000 CY of <50ppm PCB sediments were mechanically dredged, placed in 1,000 CY scows, and transported to USACE Cell #4 CDF in Lake Erie for disposal. 412,000 CY of <50ppm PCB sediments was dredged from the Buffalo River and 50,000 CY of <50ppm PCB was dredged from the City Ship Canal. 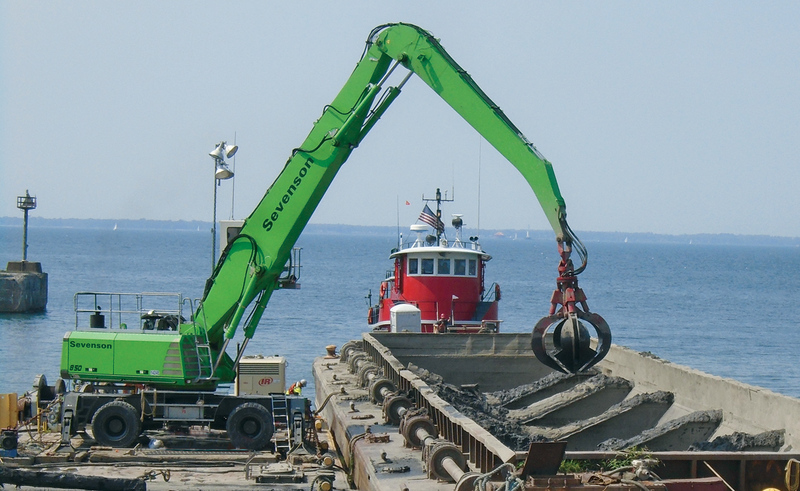 Dredging was accomplished utilizing a derrick barge with a lattice boom crane and 8 CY environmental clamshell buckets. The working dredge platform was 130 ft x 40 ft, with a 5 ft draft. 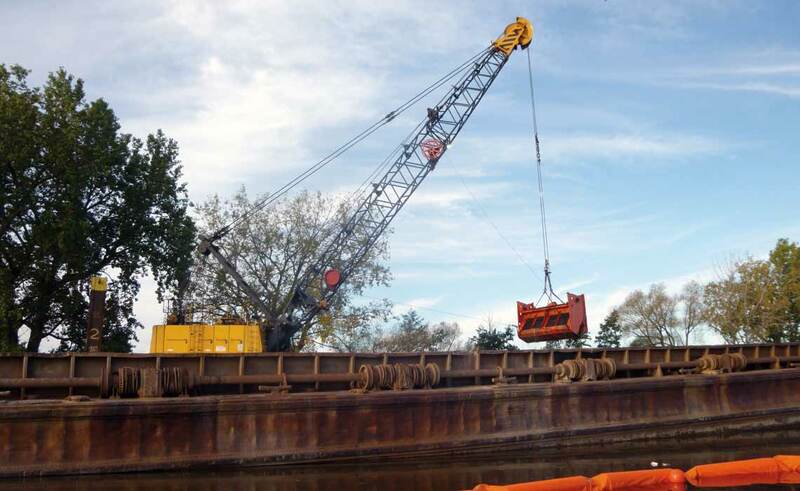 The barge was equipped with dredge positioning software to accurately provide real time data to the crane operator relative to position and depth. A second derrick barge and crane was brought in for the start of the 2014 season. 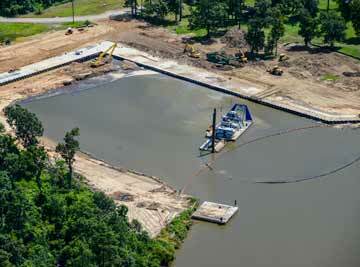 The working dredge platform was 165 ft x 55 ft, 7.5 ft draft with a 16 CY environmental clamshell bucket. Silt curtains were required in nine (9) specific Dredge Management Units. As the dredging progressed, the silt curtains were advanced with the operation. Absorbent boom was also deployed around the dredging operation, as needed. 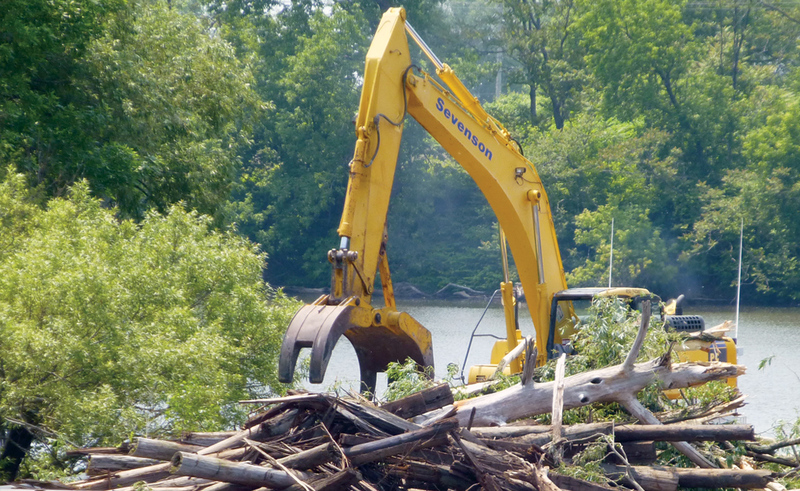 Bulk debris removal was ongoing throughout the project. This operation was done ahead of the dredging operation. Debris was mechanically removed and loaded into scows. Scows were and transferred to the CDF for disposal. An excavator staged at the docking facility was used to unload scows. Watertight scows, each with a capacity of 1,000 CY, were used to transport sediments to USACE Cell #4 CDF for disposal. Six (6) scows were used to support the dredging operation. Sediment scows were moved using two 1,500 hp tugboats. The scows were transported approximately six (6) miles to the CDF. A docking facility was constructed to facilitate sediment off-loading. The sediments were off-loaded hydraulically and pumped into the CDF through HDPE pipe. Make-up water from the CDF was used to facilitate off-loading of the sediments. City Ship Canal: The ship canal is a man-made, dead-end canal. The restoration took place in an area at the head of the Ship Canal and included approximately 4,000 ft of shoreline along both sides of the canal. 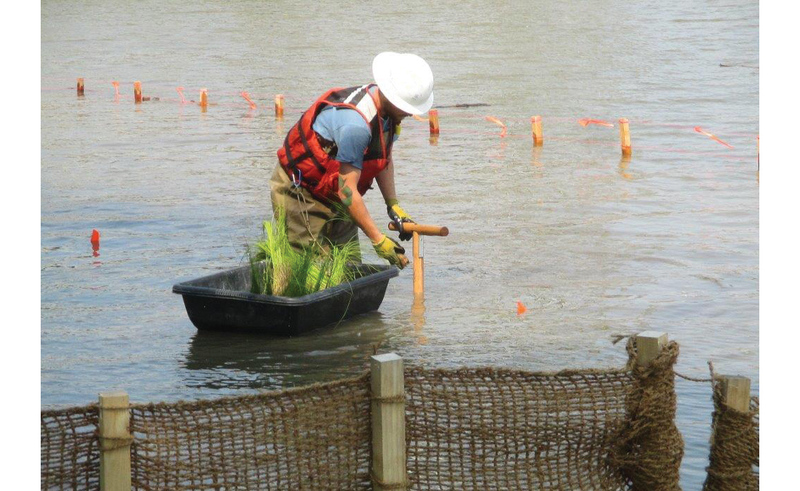 Restoration included planting grass a mix of native vegetation and plant species as well as placement of riprap along the banks. Riverbend Site: The site encompassed approximately 5,400 ft of shoreline and adjacent near-shore area on the left bank of the Buffalo River. The shoreline within the Riverbend restoration project was variable. The upstream half contained stone, concrete cap and natural sloped shorelines; riparian vegetation was present along portions of the area. The shoreline along the downstream half consisted of naturally sloped shoreline, old timber pilings, a concrete cap, and a retaining structure along the most downstream portion of the site. Buffalo Color Peninsula: This site was located on the right bank of the Buffalo River facing downstream across from the lower portion of the Riverbend Site. An area of the river was capped with a base layer of sand to stabilize side slopes, followed by a geotextile layer and then a surface layer of riprap. Katherine Street Peninsula: This site included approximately 1,600 ft of shoreline on the right bank facing downstream along the Buffalo River. The area was comprised of vegetated river bank, an abandoned industrial property, and a metal fabricating facility which had a small boat ramp and dock. Debris along the shoreline and portions of the property was removed. Topsoil, seed and trees were planted to improve the aesthetics of the area. Ohio Street Shoreline: This site is located on the right bank of the Buffalo River facing downstream. The shoreline includes a NYSDEC Park with a small boat launch, an inlet area that contains a combined sewer outfall (CSO), and a downstream portion. Restoration included improvements along 1,200 ft of naturally sloped shoreline. The cap placement was primarily done in the City Ship Canal. Cap material was comprised of a mix of sand and gravel required to meet a NYSDOT specification. The cap material was placed to depth of between 3 ft and 15 ft utilizing a Telebelt system or mechanical bucket. The cap mixture was sampled at specific intervals to confirm compliance with specifications. 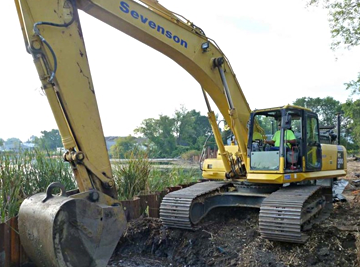 Sevenson removed, staged, and properly characterized and disposed miscellaneous scrap metal, concrete, wood and other soil debris located in the canal prior to placement of material. The placement of cap material and in-water fill designed elevations and met specifications over approximately 290,000 ft of contaminated sediment at the end of Ship Canal. After placement performance was continued in monitoring water quality in the river. After successful cap placement, bathymetric surveys and quality control checks were taken to document capping placement.